It was leaked and then it was officially announced and Shut Up & Sit Down have been secretly making a documentary about it and Aneurin's about to explode. 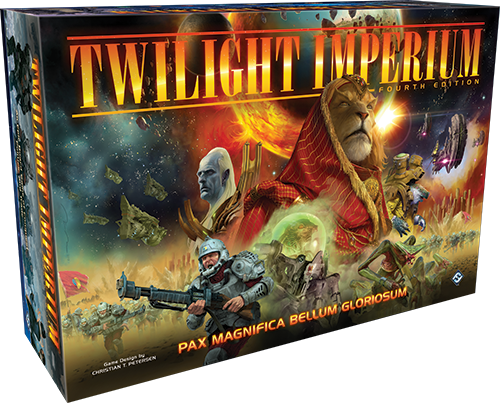 Trade - Trade contracts do not exist in Twilight Imperium Fourth Edition. Instead, commodities are traded between factions who have ships in adjacent systems. Every time the trade strategy card is used, its primary ability allows a faction to “refresh” their commodities. Then, that faction may choose to let any other factions refresh their commodities for free. Other factions may then use trade’s secondary ability to spend a token from their strategy pool to refresh their commodities. Commodities do nothing on their own, but become traditional trade goods when given to another faction. Technology - Twilight Imperium Third Edition featured elaborate tech trees as a pathway to powerful technologies. The process of researching technology has been streamlined, as there are no longer specific technologies that are prerequisites for other advancements in Twilight Imperium Fourth Edition. Instead, certain types of technology are used as prerequisites—a new tech may require three Biotic Technologies, or two Warfare and a Cybernetic Technology, making prerequisites easy to track. PDS Units and Space Docks - Previously, PDS units and Space Docks were constructed like any other unit, requiring a resource cost and an activation token to place on a planet. Now, PDS Units and Space Docks are created with the Construction strategy card, which allows a player to place either two PDS units on planets you control, or a PDS and a Space Dock on planets you control. The secondary ability allows a player to spend a token from their strategy pool to place a PDS or Space Dock on one of their planets. Politics - Previously, in Third Edition, the politics phase began with the primary ability of the Politics strategy card. Now the agenda phase occurs at the end of every round after Mecatol Rex has been claimed. Players get to refresh all their planets for the agenda phase, meaning they don’t have to split their planets for use between resources and influence. Like Third Edition, agenda cards are used to pass new laws in the galaxy, flipped from the top of the deck. After one law is voted on, a second card is flipped and another round of voting occurs. Planets are refreshed again after the agenda phase ends. Imperial Strategy Card - Previously, the Imperial strategy card’s primary ability allowed for the user to receive two victory points. Now, the card’s primary ability allows a player to receive one victory point if they control Mecatol Rex or receive an additional Secret Objective. This Imperial strategy card is more flexible but still provides a pacing element, and can be used as a powerful tool if selected at the right time. Twilight Imperium Fourth Edition includes many components first introduced in expansions for the Third Edition of the game. Flagships, promissory notes, factions, strategy cards, special galaxy tiles, and more return in Fourth Edition. Fantasy Flight wrote: The Leadership strategy card allows a player to gain additional command tokens for their fleet. The Diplomacy strategy card allows a player to prevent other factions from activating a system. The Politics strategy card allows a player to draw additional action cards and give a player the Speaker token. The Construction strategy card allows a player to build planetary structures, like space docks and PDS units. The Trade strategy card allows a player to produce commodities and gain trade goods. The Warfare strategy card allows for extended ship mobility. The Technology strategy card allows a player to research technology in exchange for resources. The Imperial strategy card allows a player to gain a victory point if they control Mecatol Rex, or draw an additional secret objective. But I'm looking forward to trying it out! Looks like they've modernised the graphic design a lot and hopefully made it easier to see what's going on. It looks like in this case at least some of the extra expense is justified by the extra components in the base game. Perhaps if you could compare the price to TI3+1expansion? The story of a community dedicated to modding TI3 rules. Shattered Ascesion wrote: Then a couple of years later, FFG did something great for their game: releasing Shattered Empire. Instead of just being a playbox of added pieces, it actually went in to replace or patch many of the compenents, the most important being the Strategy Cards. What was nice to see was how many of the changes in our Ascendancy rules that made it into the official expansion: An Imperial Strategy Card that let you claim objectives instead of receiving free points, while giving control of which objectives that would appear. Further the Diplomacy Strategy had an option of peacefully annexing a neighboring neutral planet. The price of Technology 2ndary was reduced to 6 and Micro Technology worked on the primary of Trade, and new war-based Objective card were added. All these things already existed in some form in out Ascendancy ruleset. Fighters were indirectly and elegantly nerfed through the change of Imperial 2ndary and a new Technology. It was clear that the designer had taken some time to read opinions and suggestions among the community and implemented it into the game. Shattered Ascension wrote: Then came the real turning-point to make the game truly a worthwhile and memorable experience: the carefully tailored pre-set maps, designed to promote all sorts of intrigue, diplomacy and skirmishes. While FFG's maps clearly divided the galaxy up in slices for each player to own and defend, SA's maps were largely the opposite; the layout was such that most resources was placed in contested zones equidistant from more players, completely removing the notion of things rightfully belonging to a certain player etc. Now, to acquire sufficient resources, you had to really move your ships out in the breach, do some serious negotiation, diplomacy and so forth. Skirmishes were fought without always resulting in open war, cause it most of the time happened on "neutral ground" instead in an invasion of another player's "galactic pie-slice" as were the reality with the standard maps, and even moreso with FFG's standard maps. At this time SA was as popular as ever, and I received a lot of great feedback on the forum and via mail. Almost half the games run on ti3wiki.org was under the SA-standard, and a dedicated sub-forum was opened as the existing threads were being overloaded.